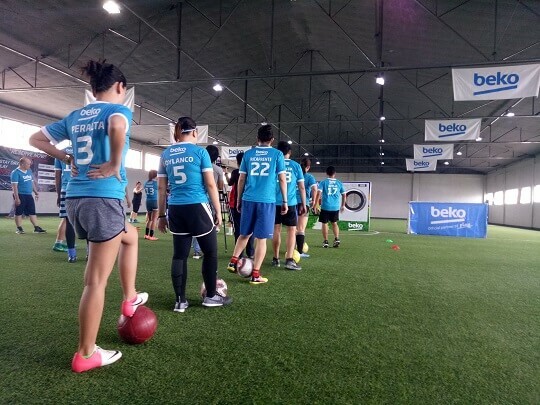 After a series of elimination rounds, Beko Philippines, in partnership with FC Barcelona, has finally awarded the grand winner of its "Kick Your Way to Barcelona: The Beko Grand Kick-Off Challenge." The last leg of the grand kick-off challenge culminated at the Sparta Philippines sports complex. Out of the 17 other finalists who competed to make the most number of goals in the makeshift Beko washing machine goal, Rafael Halili emerged as the grand winner. Halili was awarded a tax-free, all-expense paid trip to Barcelona to watch the FC Barcelona match live in April 2017. The grand prize includes a round-trip ticket to and from Barcelona, hotel accommodation with breakfast and pocket allowance, in land transfer, city tour of Barcelona, as well as a VIP La Liga match Box Ticket. For a short recap, the challenge started with Beko's promotional stint on Facebook, wherein its followers were encouraged to submit and post their creative selfies welcoming Beko's official arrival in the country. Successful entries were chosen for the qualifying round. Those who emerged on top qualified for the final round, and were then given a chance to win the Barcelona trip. Beko is one of the largest kitchen and home appliance brands in Europe. It entered the Philippine market in July 2015, and was initially available exclusively at SM Appliance Centers. With an objective to strengthen its presence in the country, Beko announced that apart from SM, it will also soon be available in other appliance stores nationwide.